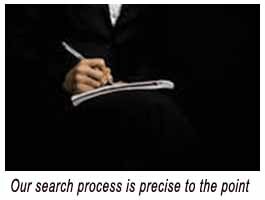 One of our key areas is Executive Search. Our Executive Search business is structured as a matrix by geography and industry practice, providing us with wholesome understanding of client requirements. Making this possible is our talent pool with a strong focus on industry sectors. We believe that no amount of structured and innovative work can be successful if the process is not driven by "Speed". And that is our key value. It is a combination of all these practices that helps us maintain strong relationship with clients ensuring smooth flow of information. Tech Lead recognizes the fact that senior executive play a crucial function in an organization, its success story. Tech Lead identify professionals for this position, having specialized skills in their area of expertise and their note worthy contribution to their present company . We assess the client needs and with agreed pointers, which helps both of us to zero in the right match. Be it the skills, domain knowledge and also adapting to the culture at the client place . A simpler hiring approach without compromising on quality standards, solely aims at drawing the best talent pool for specific needs. We realize that hiring is the one of the most crucial aspect of an organization, thus our vigilant mindset establishes a perfect balance between the quality and the organizational needs. Tech Lead Consultants High Performance corporate training in sales in Hyderabad India will provide your organization in transforming normal performers into high performers which will increase your sales. Besides being strong at behavior skills, These Tech Lead Consultants are very good at corporate training in behavior skills in Hyderabad. Tech Lead Consultants is an innovative training & development company which is active across many verticals such as corporate training in IT technical skills in Hyderabad. often said that 'IQ gets you hired, EQ gets you promoted'. Initially, Tech Lead Consultants provide corporate soft skills training in Hyderabad was conducted for the front line and middle management based on the assumption that senior level executives are adept at it. Tech Lead Consultants located in Hyderabad is a competent HR Consultant that provides corporate training in Hr skills in Hyderabad. Our unmatched experience in corporate training in hr management in Hyderabad has helped us come up with competitive and objective training modules.